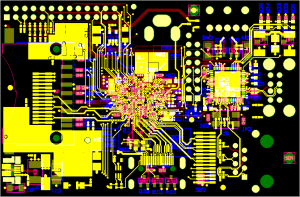 Raspberry Pi have just published the final artwork for the board. It's fascinating (and rather scary) to see how they have managed to compress a linux-capable System-on-a-chip onto a board the size of a credit card. The first boards are expected in December; meanwhile, if you'd like to help test their online shop you can buy a Raspberry Pi sticker.